Island Blue Print Co. Ltd. was founded July 4, 1912, when the assets of the Electric Blueprinting and Draughting Company were purchased by Joseph B. Davenport, a land surveyor. The acquisition coincided with a fire that destroyed the original map of Greater Victoria owned by “T.N. Hibbens Stationers”. Mr. Davenport was commissioned to replace the city map, marking the beginning of a new company to be known as Island Blue Print & Map Co. Ltd. Initially located in the basement of the Sayward Building, the company’s expansion has required several location changes. The business originally focused on map drafting, blue printing services and the sale of drafting supplies. 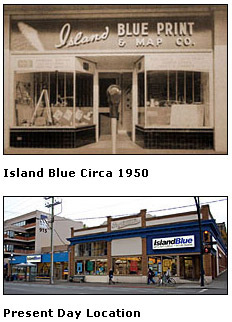 Now located at the corner of Fort and Quadra Street, Island Blue as it is known today, has transformed into a technologically advanced digital reprographics centre, providing a wide variety of black & white and full colour printing and finishing services. The company’s most recent venture, “Printorium Bookworks”, now offers soft covered book printing to authors and publishers throughout North America. Next door is Island Blue’s “Art Store”, Victoria’s largest supplier of fine artists, graphics and craft supplies. Complementing the “Art Store” is the custom picture framing division. Family owned and operated for over 55 years, the success of Island Blue rests on the principles of providing superior customer services and unique quality products supported by an excellent team of knowledgeable and personable staff members. The passion we have for our work enables us to take ownership of our clients' projects. We constantly strive to deliver the highest-quality products possible. Island Blue is a group of passionate, dedicated professionals committed to providing a creative resource for our customers to bring their inspirations, ideas and projects to life. We actively pursue innovative products, services and technologies to support the communities we serve and through integrity and pride in our performance, we will achieve our goals.